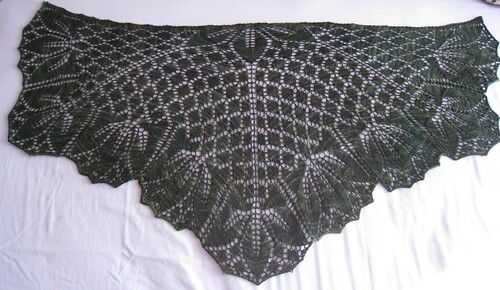 As you might imagine, all my complaining about blocking a shawl is because, well, I've completed a shawl. Bet you weren't ready for that astonishing plot twist, were you?? This pattern seemed straight forward right up until Chart 4, where suddenly the world went topsy turvy and nothing made sense and pigs flew and the sky was green, etc. You know what that means--errata. So be on the lookout for that in the final chart. 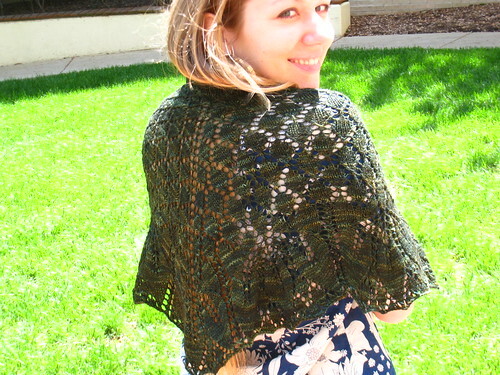 Aside from errata, I personally found the final chart to be a bit muddled with regard to a few particular stitches in the first row, which on some repeats were to be knit plain, and in other repeats, decreased. Given the space constraints of this particular chart, I don't know what the solution would be, other than to perhaps include a very clear written explanation, which is missing as the pattern stands now. 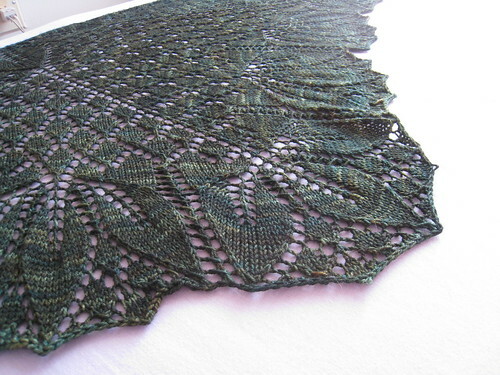 My other drama with this piece was running out of yarn, and I can blame no one but myself for that. (Well, I guess I could blame someone else, but that would be nonsensical and wrong. Yes. Wrong. And also, yarn gnomes. Yarn gnomes ate my yarn. True story!) I assumed that one skein of Bugga! would suffice, but this was not the case. 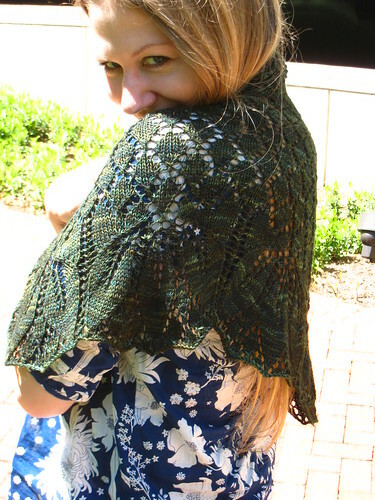 Fortunately I found a wonderful Raveler who sold me half a skein at a nice bargain, so I didn't have to shell out nearly $30 for a full second skein, when I only needed enough for 2 rows, plus bind off. 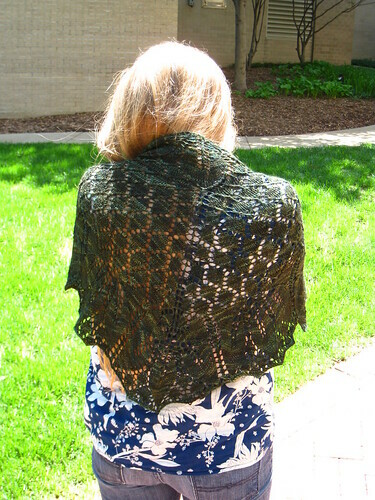 As you can see, the edge is rather pointy, which was not really the effect I was going for, as previously noted when I compared it to the knitwear equivalent of a dog collar, but otherwise, I'm quite happy with the shawl, particularly the size, which is plenty large for a "shawlette." Now, keep it to myself, or give it to my mother for Mother's Day, so she can "oh" and "ah" over it for an hour, and then shove it in the back of a drawer where I'll never see it again. Copyright Kristen Jancuk / MediaPeruana Designs. All rights reserved.